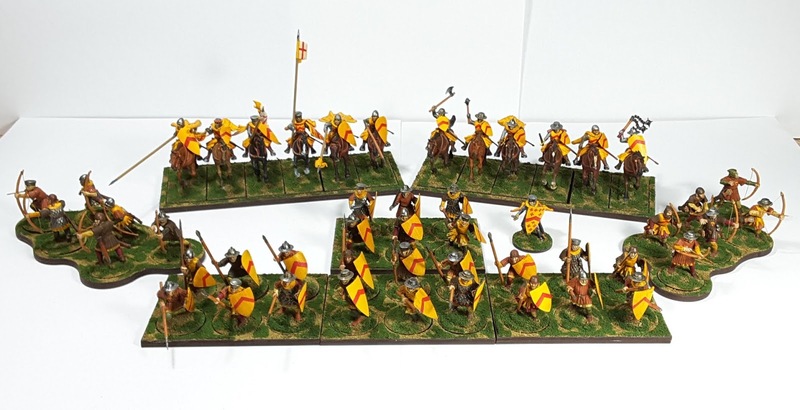 Back in late 2015 or early 2016 after some talk about Lion Rampant at a club night I decided to build a retinue. Well I have just recently completed it, other projects had higher priorities. I decided to go for late C13th English around the reigns of Henry III and Edward I, purely so I could base the retinue on Sir Richard de Holbrook or his son Sir John de Holbrook as these may have been ancestors. Fireforge plastic box sets were my figures of choice with the delay in the completion of the project allowing the purchase of their Medieval Archers set to provide my missile troops. Crossbows seemed too Frankish for this period English. The initial burst of production saw the mounted troops completed plus six foot sergeants at arms. And that's as far as I got until recently. Renewed talk at the club led me to complete my retinue with the aforementioned archers being purchased and a sustained build and paint effort. Sabot bases were acquired from Warbases to allow for faster movement once on the table. The completed retinue with a dismounted version of the leader if required. 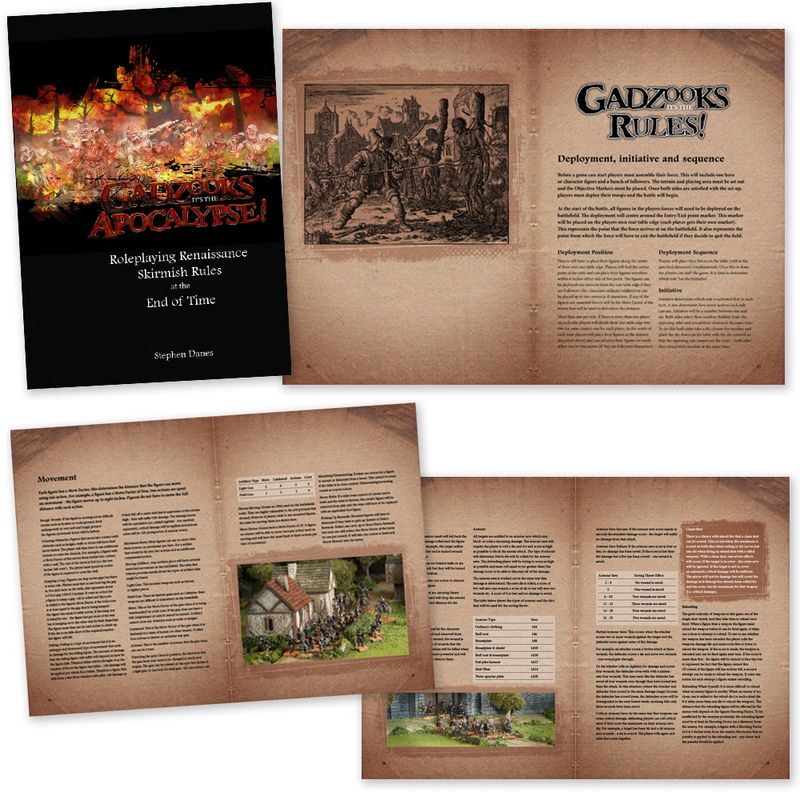 Gadzooks it's the Apocalypse are a set of ‘Renaissance skirmish rules at the end of time'. I am hoping to turn this into another self-publishing project similar to Setting the Scene (now in its 3rd printing, stevenlampon.co.uk/portfolio), with the rules author Steve Danes who is another wargaming friend of mine. A dedicated website and Facebook group will be set up in due course. Steve has written many sets of rules for this period, including Father Tilly, Bloody Kingdom, Lace Wars, To the Banners and most recently Furioso for Alternative Armies. 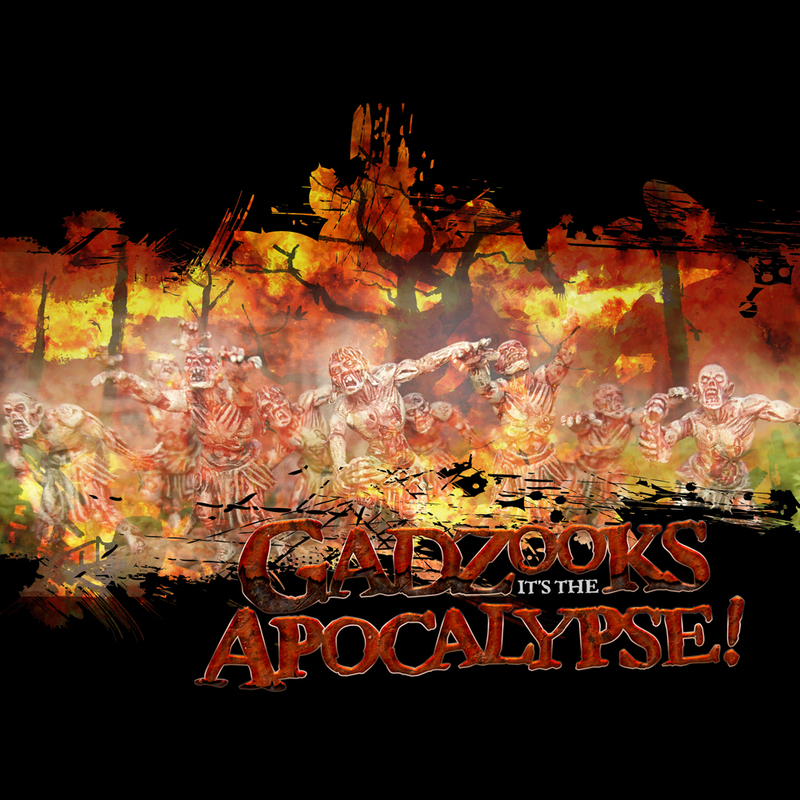 Gadzooks, it's the Apocalypse is a game set in the first half of the 17th century. This was a period of widespread warfare, religious strife and general unrest. It was a time when very bad things were happening and when people had very definite ideas about what was going wrong with the world. Many saw this time of war and disorder as being the early signs of the coming Apocalypse and the end of time. So it is in this time of catastrophe, prejudice and fear that the players will be entering – what a great setting for a game! Each player will control one character figure and a bunch of dubious looking henchmen. The character will have a detailed profile, a number of skills and qualities that can be improved upon if scenarios are survived and experience is gained. Henchmen are cheap and expendable and there are always plenty more to hire. If the character gains renown, better quality henchmen can be hired. Each character will have a specific profession or class that will determine the type of skills and powers that they can acquire and improve upon in time. But players should beware, evil forces are at work at every turn. Characters that indulge in wicked and cruel acts will begin to attract the attention of sinister powers, maybe this new hero will become a champion of evil? Perhaps they will lose all shred of humanity and take on a demonic or corrupted form. Players will have to remember that the battle at the end of time approaches and sides will need to be chosen. 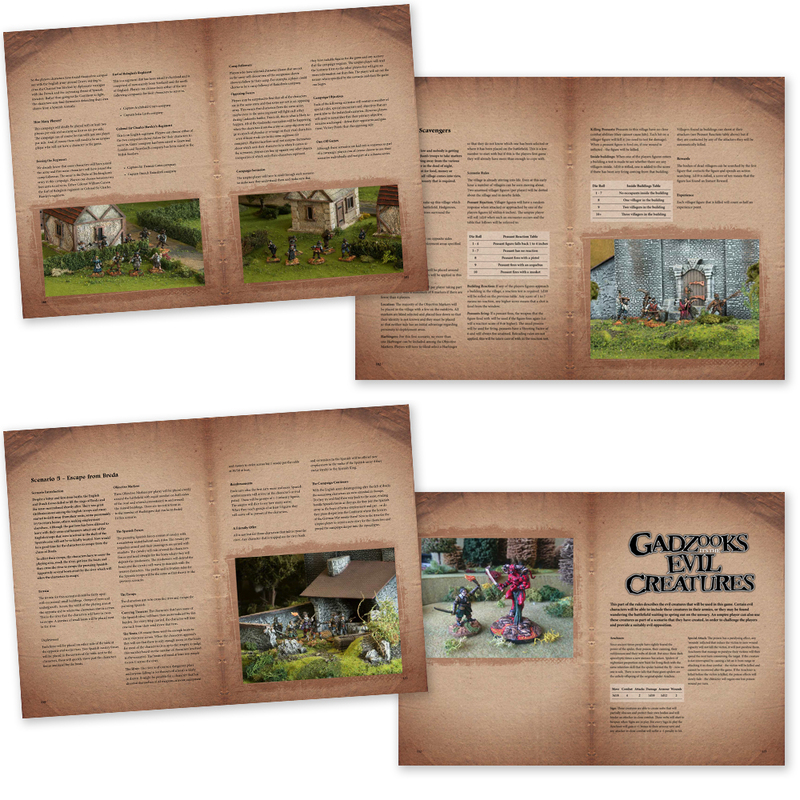 Gadzooks is a skirmish/roleplaying game comprising two opposing sides of one or more players each. If there is more than one player per side all players will strive to gain victory for their side – but some players will strive more than others. Just because there is more than one character on the same side does not mean that each character will work in perfect harmony. Even on the same side, different characters might have different objectives and motivations. It doesn't even matter if players have characters that seem highly antagonistic to each other, some might be overtly evil and others undeniably good – but they can still join forces to defeat their enemy and claim their rewards. Oh good, bug AGAIN! original post on Medieval Gallery only. Jabba, your figures look smashing! Maybe they could lend a helping hand in fighting off the Apocalypse? They look really nice, I love the colours!